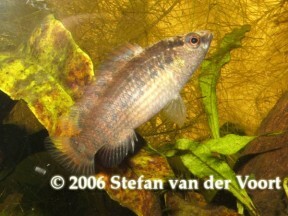 Adult male of Badis blosyrus. Adult female of B. blosyrus. The type series was collected close to the town of Raimana in western Assam state, northern India and at the time represented the only known population of the species. It has since been collected in the nearby Buxa (often spelled ‘Buxar’) National Park, West Bengal state, from the Raidak River, a tributary of the Brahmaputra rising in Bhutan, and from streams of the western Garo Hills in Meghalaya state, south of the main Brahmaputra channel (tentative identifications). In the Raidak River it was collected from flowing, cool, shallow (~ 0.6m deep) water with a substrate composed mainly of small rocks with some patches of sand. Marginal vegetation was growing thickly and sympatric species included Amblyceps, Garra, Psilorhynchus, and Schistura species as well as Caridina and Macrobrachium species shrimp and the pipefish Microphis deocata. At the type locality it was found living sympatrically with both B. kanabos and Dario dario. Around 65 – 70 mm for males, with females a little smaller. A single pair or small group can be housed in a tank with a base measuring 75 ∗ 30 cm or more. B. blosyrus will thrive in a well-structured set-up with a sand or gravel substrate plus plenty of water-worn rocks and pebbles to provide cover. Plant species that can be grown attached to the decor such as Microsorum, Taxiphyllum or Anubias species can be added if you wish but aren’t essential. Driftwood twigs, branches, floating plants and leaf litter can also be used to lend a more natural feel while filtration and lighting need not be too strong. Some cave-like structures should be included to act as potential spawning sites; many breeders use half-coconut shells or up-turned clay plant pots with drilled holes or parts of the rim removed to allow the fish access. Temperature: This species is subject to seasonal temperature fluctuations in nature and is comfortable between 15 – 25 °C with even greater extremes being tolerated for short periods. In many countries/well-insulated homes it can be therefore maintained without artificial heating year-round. Temperatures towards the upper end of this range are known to stimulate spawning activity meaning a heater will be required if you want to breed the fish outside of spring and summer months though. Set it to around 68 – 75?°F/20 – 24?°C for long-term care and breeding. pH: Does best in slightly acidic to neutral water with a value of 6.0 – 7.5. Badis species are micropredators feeding on small aquatic crustaceans, worms, insect larvae and other zooplankton. They can be a little picky in the aquarium and may not accept dried foods although in some cases they will learn to take them over time. At any rate they should always be offered regular meals of small live or frozen fare such as Artemia, Daphnia or glassworm in order to develop ideal colour and conditioning. They’re somewhat shy, deliberate feeders (see ‘compatibility’) and it’s also important to note that all species develop issues with obesity and become more susceptible to disease when fed chironomid larvae (bloodworm) and/or Tubifex so these should be omitted from the diet. Can be kept in a community tank provided tankmates are chosen with care. It is slow-moving with a retiring nature and may be intimidated or outcompeted for food by larger/more boisterous tankmates while very small fish may be predated upon. Peaceful, schooling cyprinids make good choices as do most gouramis because these tend to inhabit the upper parts of the tank. Accommodating it in a biotope-style community of West Bengalese fish is more tricky although suitable species from the region include Pethia gelius, Parambassis ranga, Colisa lalia and C. chuna. Certainly do not combine it with similar-looking, territorial bottom dwellers such as dwarf cichlids unless the tank is very large and never house it with other Badis species as hybridisation might occur. Also note that freshwater shrimp of the popular genera Caridina and Neocaridina, and certainly their young, may be preyed upon. It is not a gregarious fish and rival males can be very aggressive towards one another, especially in smaller tanks. In these cases only a single pair or one male and several females should be purchased but in roomier surroundings a group can coexist provided there is space for each male to establish a territory and plenty of broken lines of sight. The clever placement of caves can help enormously in this respect; do not be tempted to cluster all the available spawning sites in one area of the tank, for example. Post-spawning the female is ejected and the male takes sole responsibility for the eggs and fry, defending the territory against intruders and fanning the brood with his fins. If you wish the other adult fish can be removed at this point although it is not absolutely necessary yet. The eggs usually hatch in 2-3 days but the fry do not become free swimming until they are 6-8 days old and may not leave the vicinity of the cave for another week or so after that. 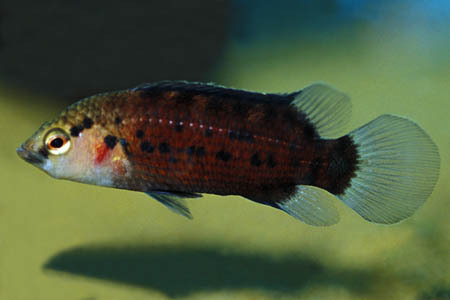 From then the adults (parent male included) may begin to regard them as food and are best transferred to a separate tank. The young fish are quite sedentary for the first few days meaning microworm is the ideal initial food but once they are visibly swimming in the water column Artemia nauplii can be introduced to the diet. Badids have historically been considered members of the families Nandidae or Pristolepididae and it was not until 1968 that Barlow proposed a separate grouping for them. They share some characteristics with anabantoids, nandids and channids; most notably for aquarists the typical spawning embrace in which the male wraps his body around that of the female. More recent studies have concluded that this procedure is an ancient trait inherited from a common ancestor to all these families. In the 2002 revision paper all Badis, Dario and Nandus species were found to share a uniquely bifurcated (split) hemal spine on the penultimate vertebra and the authors hypothesise that this may represent evidence of the monophyly of this group. They further propose that the family Nandidae should be restricted to include only Nandus species with the other genera (Polycentrus, Monocirrhus, Afronandus and Polycentropsis) grouped together in Polycentridae. Following this system the Nandidae and Badidae are only separated by differences in morphology and egg structure although the phylogenetic relationships between them are yet to be fully-studied.